The latest United Nations report on North Korean sanctions has once again highlighted the role of foreign companies in cases of UN sanctions evasion. The March 2014 report by the independent Panel of Experts assigned to monitor sanctions against the DPRK on behalf of the UN noted the widespread involvement of foreign companies. A new SIPRI study backs up the UN report and goes further, showing that foreign company involvement in North Korean sanctions violations is not new and is more than just a trend—foreign companies and individuals travelling on foreign passports constitute an overwhelming majority of those identified as involved in the violation of both multilateral and unilateral sanctions dating as far back as 2004.While the majority of companies and individuals identified as involved in sanctions violations are either registered abroad or hold foreign passports, the international community continues to overwhelmingly target companies and individuals registered in North Korea. This targeting takes the form of “designations” by which the United Nations and the European Union together with countries such as Australia, Japan and the US order asset freezes on particular companies, as well as trade bans, and slap travel bans on named individuals traveling on North Korean passports. Figure 1. Designated entities by place of registration. For all figures, click to enlarge. Image © 2014 SIPRI. All rights reserved. These dynamics—identified for the first time in the SIPRI study—may have implications for policy-makers seeking to apply new rounds of sanctions on North Korea in response to any fourth nuclear test. Most firms designated by the UN and the EU as well as Australia, Japan and the United States are North Korean-registered trading companies while virtually no North Korean transportation companies have been designated. In contrast to trading companies which have few fixed assets and can easily switch name and other forms of corporate identity, transportation companies that utilize aircraft and ships are easier to monitor and track despite name-changes. Given the key role that transportation plays in the logistics of sanctions evasion, the SIPRI study provides a number of recommendations in support of these and other findings. A detailed survey of all documented cases of North Korea sanctions violations shows that a significant majority of all companies and individuals involved were registered outside North Korea. In total, of 161 entities, individuals and fixed assets such as vessels and aircraft identified as involved in the movement of goods to, from or on behalf of North Korea that have been prohibited under United Nations sanctions, 74 percent (120) were either companies registered in third countries or citizens of a State other than North Korea. Only 21 percent (35) of entities and individuals could be confirmed as North Korea-based entities or DPRK passport holders. Figure 2. Designated entities by location per sanctions regime. Image © 2014 SIPRI. All rights reserved. In contrast to the preponderance of foreign-registered firms documented as involved in sanctions evasion, a significant majority of multilateral and unilateral sanctions exclusively target North Korean registered entities or nationals. Of the companies designated by the United Nations under the DPRK sanctions regime, 84 percent (16) are located in the DPRK, one in Iran, and one in Hong Kong. In the case of EU sanctions, 89 percent (31) of the entities are located in the DPRK, three in Iran, and one in Hong Kong. 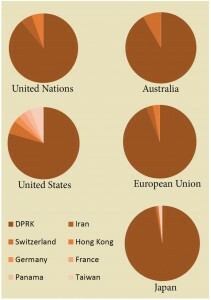 Unilateral designations follow a similar pattern, with 92 percent (11) of Australia’s designations targeting North Korea-registered companies and individuals; 95 percent (124) of Japan’s designations affect North Korea-based companies and individuals; and 91 percent (72) of all US designations target North Korea-based companies and individuals. Another SIPRI finding is that companies involved in trade are most commonly designated but companies involved in transport have not been targeted. Of entities designated by United Nations Security Council, 63 percent (12) can be classified as trading companies. Those in the financial and scientific sectors represent 16 percent (3) each while one company, the Korea Ryonha Machinery Joint Venture Corporation, falls within the industrial sector. Within the sanctions regime maintained by the European Union, 53 percent (18) of designated entities are also in the trade sector. Of the remaining entities, 5 are financial institutions, 5 are in the science sector and the remaining entities are in the political, mining, military, intelligence, industrial or chemical sectors. Similar trends are apparent in the entities designated under US, Japanese and Australian sanctions. Figure 3. 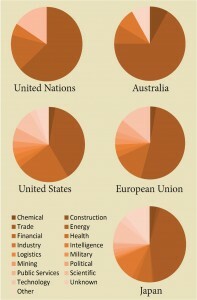 Designated entities by industrial sector per sanctions regime. In contrast, only one transportation company has been targeted by sanctions despite the central role that these firms play in the transfer of banned goods. Japan has designated the Korea Tonghae Shipping Company, which shares office space with the DPRK Embassy in Singapore and Chinpo Shipping, one of the firms cited as being involved in the Chong Chon Gang case. No other DPRK-related transportation companies have been designated by the UN, EU, Australia or the US. Another finding of the SIPRI study is the increasing use of offshore business centers by DPRK-related proliferation networks. For example, Hong Kong-registered secretarial companies have played a critical facilitation role, acting on behalf of three companies, including the owner of the ship that transferred vehicles adapted as ballistic missile Transporter Erector Launchers (TELs) from China to North Korea in August 2011; the owner of another ship intercepted on suspicion of transferring missile technology to Myanmar in May 2011; and the owner of a logistics company that shipped prohibited dual use goods seized en route to Syria in September 2010. Offshore business centers also allow for corporate obfuscation in the trafficking of arms via air transport. In December 2009, a company named Union Top Management (UTM) was created in Hong Kong days before the flight of an Ilyushin 76 aircraft transporting arms from Pyongyang to Iran. False transfer documentation assigned UTM a leading role in the trafficking incident, but the United Nations determined that UTM was a corporate shell, owned and operated by two other local firms which were in turn owned by a firm named Global King Ventures in another offshore center, the British Virgin Islands. Another foreign arms dealer also established a Hong Kong-based business prior to his attempt to transfer North Korean surface-to-air missiles to Azerbaijan in 2010, for which he was later convicted. In this instance, the British arms dealer established a company named Hong Kong Commercial Limited, prior to the attempted trade under the name of an associate. In these cases and others examined in the SIPRI study, the ability to construct anonymity before a high-risk trade appears to have been a priority. However the ease with which multiple corporate identities may be established may also be an important factor. For example, the Hong Kong-based New East International (Hong Kong) Trading Limited (NEI) attempted to export technology used in the production of centrifuge and ballistic missile components from Japan to Myanmar in 2008 on behalf of the Korea Mining Development Corporation (KOMID). Both directors used a variety of passports, some consecutively numbered, from the DPRK and the Republic of Korea as well as offshore passport providers in the Seychelles and Kiribati. The type of DPRK passport used by one director suggests government service and the other shares a name with a staff member at the Beijing embassy. These same individuals co-directed two other trading companies in Hong Kong, Crown Fortune Trading (Hong Kong) Limited and Gold On Trading Limited (the latter in partnership with two North Korean citizens). If designation is to remain an instrument of both international and national sanctions policy, then greater consideration should be given to designating foreign-registered entities or individuals complicit in DPRK sanctions evasion. The current absence of designated transportation actors suggests that states and organizations examining options for designations in response to future violations may wish to consider rebalancing away from North Korean-registered trading companies. Instead, the targeting of specific transport-related companies or vehicles should be considered in order to more accurately reflect the important role played by maritime and aviation-related companies in sanctions violations. Given that the most valuable data for risk assessment of attempted transfers lies within reach of shippers, more effort needs to be made to harness business information, particularly in the transport sector where nearly all non-DPRK shipping companies have incentives to comply with UN and other sanctions. One of the most significant problems facing policy-makers charged with North Korean sanctions monitoring is the information deficit, and in particular, a lack of court-admissible evidence that may be used to justify the designation of foreign companies. Beyond the transportation sector, it is an increase in resources and information-sharing within and between UN Member States that may lead to the designation of more foreign companies involved in the circumvention of North Korean sanctions. Some of the foreign companies and individuals involved have been prosecuted or were otherwise assessed as complicit in the transfers. 51 were assessed as unknowing participants. The location or passports for 5 percent of the designated entities could not be confirmed. The location of one other entity has not been conclusively proven. The location of the two remaining entities has not been conclusively proven. In each of the designations made by the US, EU, Japan and Australia, trading firms are similarly prominent, ranging from 39-73 percent of all targeted companies. Japan’s sanctions regime is similar with 45 percent (56) of designated entities having been trade-related and the remainder sitting in a variety of industries. See United Nations, Security Council, Report to the Security Council from the Panel of Experts established pursuant to Resolution 1874 (2009), S/2013/337, June 2013. Alternatively, reference individual addresses. United Nations, Security Council, Report to the Security Council from the Panel of Experts established pursuant to Resolution 1874 (2009), p. 86. Ibid, paragraphs 90-94; and HM Revenue and Customs, “Arms to Azerbaijan Dealer Jailed,” July 20, 2012, http://hmrc.presscentre.com/Press-Releases/Arms-to-Azerbaijan-Dealer-Jailed-67d78.aspx; and Companies Registry, Hong Kong. http://www.cr.gov.hk. United Nations Sanctions Committee in April 2009, United Nations, Security Council, Letter dated 24 April 2009 from the Chairman of the Security Council Committee established pursuant to resolution 1718 (2006) addressed to the President of the Security Council, S/2009/222, April 24, 2009. See “Kiribati passports were sold to N Koreans: president,” ABC News, March 7, 2013, http://www.radioaustralia.net.au/international/2013-03-07/kiribati-passports-were-sold-to-n-koreans-president/1098112. See Companies Registry, Hong Kong, http://www.cr.gov.hk. Service passports are prefaced with the letter “S.” For differentiation of DPRK passports see note 8, p. 25. For an embassy staff listing see Ministry of Foreign Affairs of the People’s Republic of China, “DPRK Embassy,” June 30, 2006. Archived by Internet Archive at http://web.archive.org/web/20060630094520/http://www.fmprc.gov.cn/chn/lbfw/namelist/embassy%20list/t144331.htm. The same individual was named as working at the embassy in 2013. See Ministry of Foreign Affairs of the People’s Republic of China, “DPRK Embassy,” September 9, 2013, http://www.fmprc.gov.cn/mfa_chn/ziliao_611306/wjgmc_611378/t527236.shtml. Companies Registry, Hong Kong, http://www.cr.gov.hk.